So a bunch of Bev’s friends and admirers have pulled together a little virtual baby shower to celebrate her. 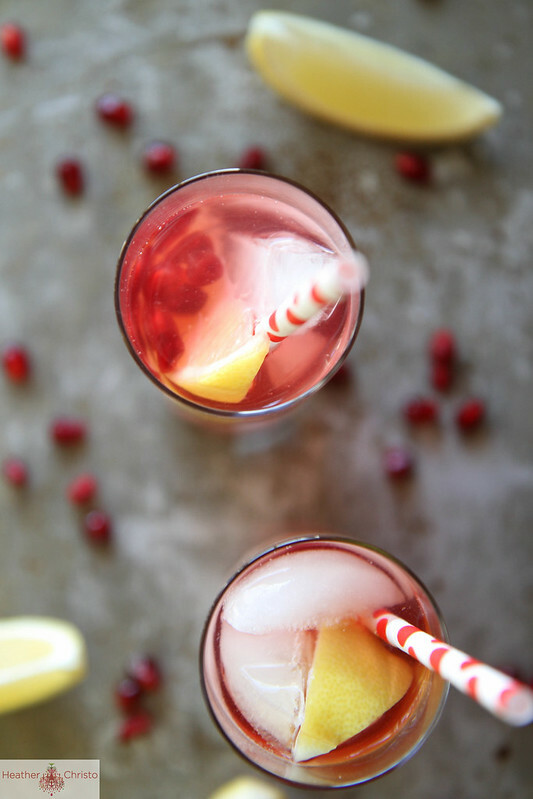 I was in charge of a drink, and I chose this Pomegranate Lemonade Punch. It has a hint of ginger, which makes it feel festive, and it can be made with or without vodka so it could be made for lots of different occasions. Please feel free to pop around to the other links included below and check out the other wonderful contributions from Bev’s friends! In a small saucepan, heat the sugar, water and ginger until the sugar dissolves. Dispose of the ginger and transfer the syrup to a heat proof container (like a mason jar) and refrigerate until ready to use. In a pitcher filled with ice cubes, combine the Pomegranate juice, ginger simple syrup, fresh lemon juice and vodka (if adding). Stir well. 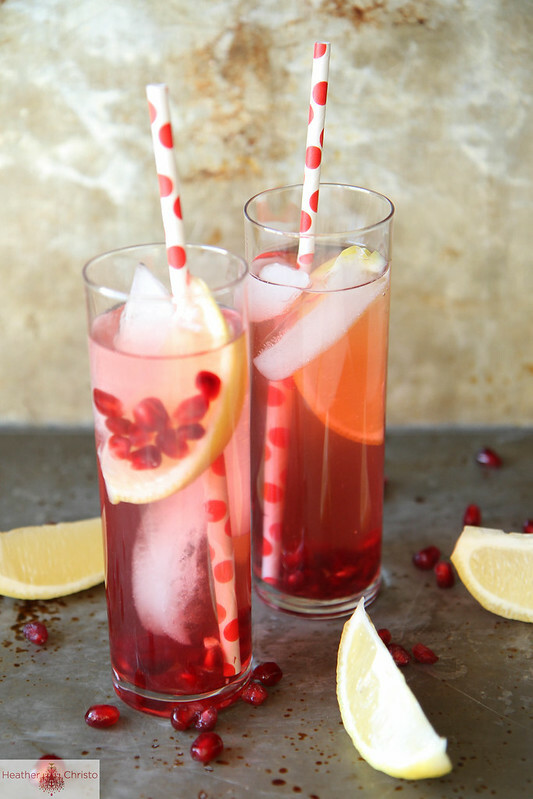 Fill 4 glasses with ice cubes and add lemon wedges and pomegranate seeds. Pour the punch over the ice cubes and serve immediately. Your punch is so pretty, love the polka dot straws! This is the prettiest punch!! Bev is amazing, I’m so happy for her – she’s going to be do surprised! 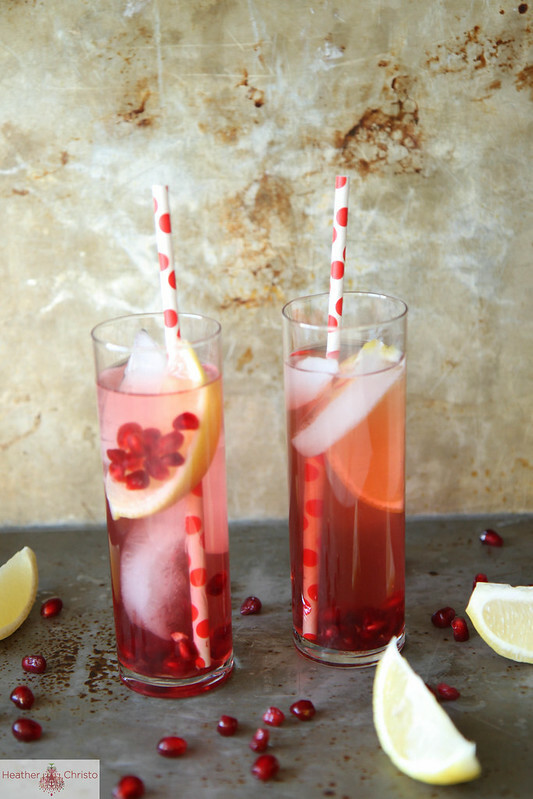 What a pretty and refreshing winter drink! You all really know how to throw a party! Yum! What a beautiful, festive punch! Great for the kiddos to drink for the holidays. This is so gorgeous and perfect for a baby shower! This looks so pretty and festive!! Ahhhhh! I LOVE IT. I’m so blown away today I can hardly take it! And yes, this time last year we were together in NYC. At some point we muuuuust get together again! Thank you, Heather for being a part of this celebration! I’m all kinds of dying. Oh congrats to Bev! And your punch looks irresistible! Oh, so gorgeous! I’ll take a tall glass of this, please! This is too beautiful — love the pretty pomegranate seeds in the bottom of the glasses!! You had me at ginger syrup!! What a stunning punch! That ginger simple syrup is calling my name. Lovely party drink! You’re a mix master Heather! Love these! I knew you’d make something incredible! So what does everyone else get to drink after I down the entire pitcher? Such a beautiful and perfect punch for a baby shower! these are gorgeous! I’d love a glass in my hand right now! this is gorgeous, Heather! beautiful color – perfect for the holidays, too! Oh I LOOOOVE this cocktail! Heather, this drink is so beautiful!! I know Bev would love it! Such a gorgeous addition to the baby shower, Heather! Oh my goodness! These are so fun! Love the pomegranates! Pingback: The Ultimate Lemonade Round-Up by Style Me Pretty Living | the joy scout!the joy scout!